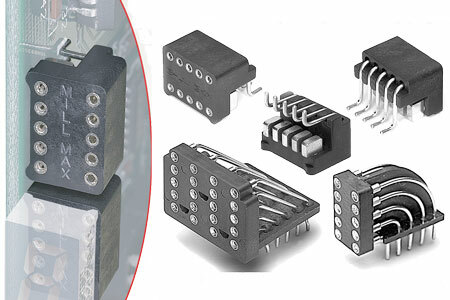 Series 296, 299 and 594 vertical display sockets are used to mount dot matrix and 7 segment LED displays at the edge of and perpendicular to a printed circuit board. This positions the display directly behind the translucent front panel of the equipment. Series 299 and 594 are through-hole mount and can be wave or intrusive reflow soldered. Series 296 is surface mount and can be supplied on a carriertape for automated "pick 'n place" assembly. Insulators are high temp. Nylon 46, suitable for all soldering processes including "lead free."